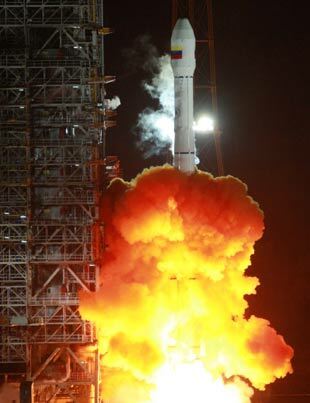 China successfully sent a Venezuelan telecommunication satellite into space on the early morning of Thursday. It is China's first contract of manufacture and launching service for a Latin American country. Carried by a Long March 3II rocket, the satellite was launched from the Xichang Satellite Launch Center located in southwest China's Sichuan Province. The satellite was produced by China Aerospace Science and Technology Corporation with an all-up weight of 5,100 kg and an designed longevity of 15 years. The orbiter, named as Venezuela 1 Telecom Satellite, is the first telecom satellite of Venezuela which will be used in broadcasting, tele-education and medical service by coving the most regions of South America and the Caribbean region. It will of great importance to improve living standards of the people living in the country's remote areas. It has been also named as "Simon Bolivar Satellite" in the south American country to commemorate the independence leader of the Latin America in 1800s. According to the website of the Great Wall Industry Corporation, China's sole contractor for such space business, the country began its commercial space launch business on August 5, 1987, when a Long March 2C rocket carrier launched a micro-gravity test instrument for the French company Martra Maconi. In 1990, a Long March 3 sent the AsiaSat-1 Communications Satellite for the AsiaSat HK company into space.